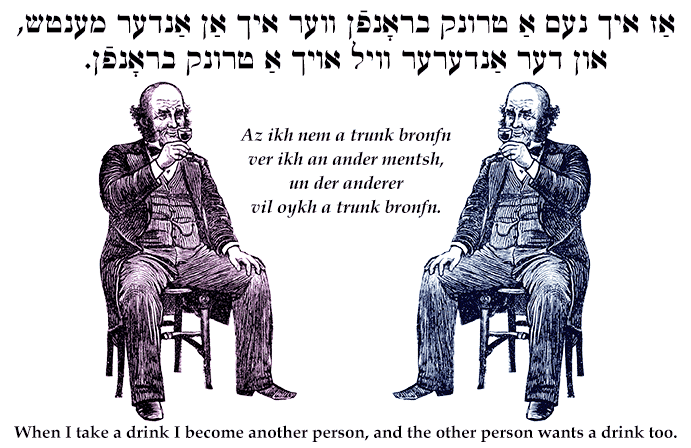 Yiddish Wit: When I take a drink I become another person, and the other person wants a drink too. ‏אַז איך נעם אַ טרונק בראָנפֿן ווער איך אַן אַנדער מענטש, און דער אַנדערער וויל אויך אַ טרונק בראָנפֿן. Az ikh nem a trunk bronfn ver ikh an ander mentsh, un der anderer vil oykh a trunk bronfn. When I take a drink I become another person, and the other person wants a drink too.